You've probably heard this greeting more than once during the dog days of summer. If you're like most growers, your main concern is less for yourself (you can get out of the heat!) than for your crops. Most vegetables — even the ones we think of as "heat-loving" — don't do well when temperatures soar into the 90s and stay there. This 2-part series on heat-tolerance basics can help you put a plan in place now for hotter days ahead. Here in Part 1, we cover basic production strategies for getting your crops through summer's heat — a mounting challenge for many growers. In Part 2, we address the needs of cool-weather crops as temperatures climb, as distinct from inherently heat-loving crops — though there are differences among both. We also provide recommendations for cool-weather varieties that perform best in the heat. Use our Germination Guides to schedule your hot-weather plantings. The guides appear on each product page on our site and in our catalog. 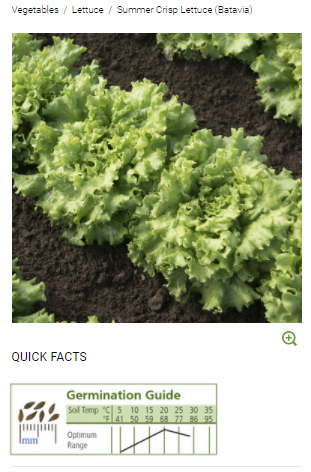 For information about growing lettuce, brassicas, and other cool-weather crops in warmer weather, see Part 2. Heat-Tolerant Cool-Weather Crops. For details on post-harvest handling of summer-harvested crops, see our Chart of Cooling Methods & Storage Conditions. No matter which crops you grow or where you grow them, there are production, harvest, and post-harvest handling practices that allow for an optimal outcome when temperatures soar. These are basic practices that help to diminish the detrimental consequences of too much heat on crop yield, flavor, appearance, and marketability. For every crop there is a well-established minimum, maximum, and optimum range for germination, as depicted by the Germination Guides we include on product pages. You've probably referred to the minimum temperatures to schedule plantings in spring, when the soil is just warming up. By keeping an eye on the maximum germination temperatures, you can be sure your soil is cool enough for hot-weather plantings as well. Soil temperature-reducing measures include shading, irrigating, and mulching the beds for several days before you plant. If you're seeding under cover, in a greenhouse or other structure, use the coolest available location. Here at Johnny's, we use the northeast corner of the greenhouse to get our summer plantings up and growing. Reflective mulch and shade cloth help keep things cool. In hot climates around the world, vegetables and cut flowers are grown under shade cloth to reduce heat and light intensity, resulting in better quality and higher yields. It can be used throughout a crop's lifecycle or at a particularly vulnerable stage to provide a heat-protective barrier. Shade cloth is made of a weather-resistant, woven or knitted fabric in densities ranging between 12% and 90%. The density listed designates the percentage of light blocked by the cloth; for example, a 47% shade cloth blocks 47% of the light. In high heat, most vegetables should be grown under 30% to 50% shade. Shade cloth with density of greater than 50% is generally used for shade-loving plants or as a windbreak. The key to success with shade cloth is to hang it high enough over the plants, to provide enough ventilation to prevent heat from building up beneath it. This is easily accomplished in a greenhouse, hoophouse, or other specially-built shade structure, such as those seen at nurseries. 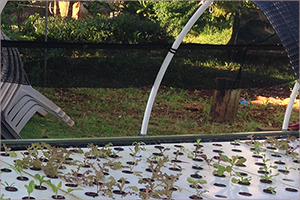 Low tunnels made with Johnny's Quick Hoops™ Benders offer an inexpensive alternative. Shade cloth can be laid over the Quick Hoops, with the sides left uncovered for maximum ventilation. 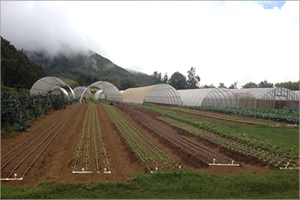 Low tunnels are easily assembled and disassembled, to accommodate changing conditions and crop needs. Together with proper ventilation, shading can also help reduce temperatures to more optimal levels for seed-starting in the summer and, as mentioned, provide protection from drying winds. Crops in the protective zone of a windbreak. Regardless of temperature, wind has a drying effect, and can push tender crops past their permanent wilting point. Planting in the lee of a natural, planted, or other physical windbreak serves a similar function to shade, decreasing evapotranspiration, without decreasing the light the crops receive. Transplanting broccoli into an irrigated field. Transplanting in the cool part of the day, where possible, is best, either early in the morning or at the end of the day. In very hot spells, avoid midday planting altogether. With adequate watering-in, plants usually fare okay when transplanted in the afternoon. Growers should provide plenty of water throughout the transplanting process, however, to help keep the young plants cool and reduce their rate of transpiration. 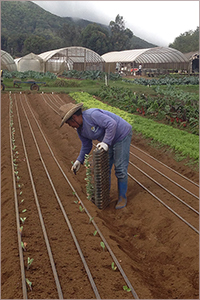 On hot days, transplanting during overcast conditions or during light rain events is also preferable, but doing so during heavy rain can damage tender seedlings and increase soil compaction. 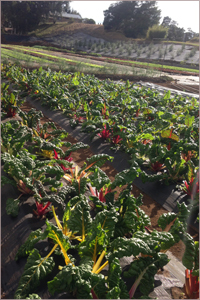 'Bright Lights' chard on reflective mulch. Another effective way to reduce heat is to transplant onto heat-reflective or light-reflective mulch. White-on-Black Mulch is a two-sided product you can apply white-side-up to keep the soil cool, and black-side-down to suppress weeds. Metallic Silver Mulch repels insects, cools the soil, and reflects light. Other mulching options include straw or other organic matter to help retain moisture and lower soil temperature slightly. The cool water itself reduces soil temperature on contact. Increasing plant bed moisture during warm spells (though not in muggy or foggy conditions) helps increase plant evapotranspiration, which in turn creates a microclimate by drawing heat up and out of the ground. View our Watering & Irrigation Supplies. 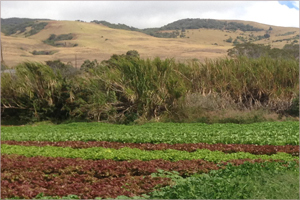 Irrigated greens in field production. Time Your Harvest. Harvesting has to be done when it has to be done. Just as with transplanting, however, it is best done during the cooler times of the day, especially during hot spells. Immediately Cool Your Harvest. Ideally, most crops harvested in warm weather should be immediately washed upon harvest — in either cool or cold water — to remove field heat. Other options include harvesting and promptly bringing the produce to a cooler, placing it in an ice chest, or top-icing. The key is to remove any excess field heat from the crop. Post-Harvest Sun Is the Enemy. In warm weather, move harvested crops out of direct sunlight as soon as possible — the longer they sit in the sun or wind, the more they will wilt, dry out, and before long, become unmarketable. For more details, refer to our Chart of Post-Harvest Cooling Methods & Storage Conditions. While most of the recommendations we've laid out above will seem intuitive, a reminder of what lies ahead can help you lay a better plan and put that plan in place — before the heat hits.